The latest results of the Borexino collaboration on understanding the Sun with neutrinos and neutrinos with the Sun. Humans have marveled at the Sun since the dawn of civilization. Identified first as the source of life through myths and legends, the Sun eventually became the target of scientific investigation. What has remained unknown to humankind until the twentieth century, is that in addition to heat and light, the Sun is also an intense natural source of neutrinos: every second, every square centimeter on the Earth’s surface, is crossed by sixty billion neutrinos emitted from the core of the sun 150 million kilometers away. Today, we use this incredibly intense source of neutrinos to study how the Sun works and, at the same time, the properties of the neutrinos. It is indeed fascinating that we can use neutrinos, the lightest of the fundamental particles of nature, to understand the Sun, a celestial object that could contain 1.3 million Earths. The first breakthroughs in unveiling the processes powering the Sun have been possible after the discovery of the weak interaction and the birth of nuclear physics. Nowadays, we know that the Sun produces around 99% of its energy through the proton-proton fusion chain, a sequence of nuclear reactions converting hydrogen into helium. It is, in fact, along these fusion processes that the neutrinos are emitted. 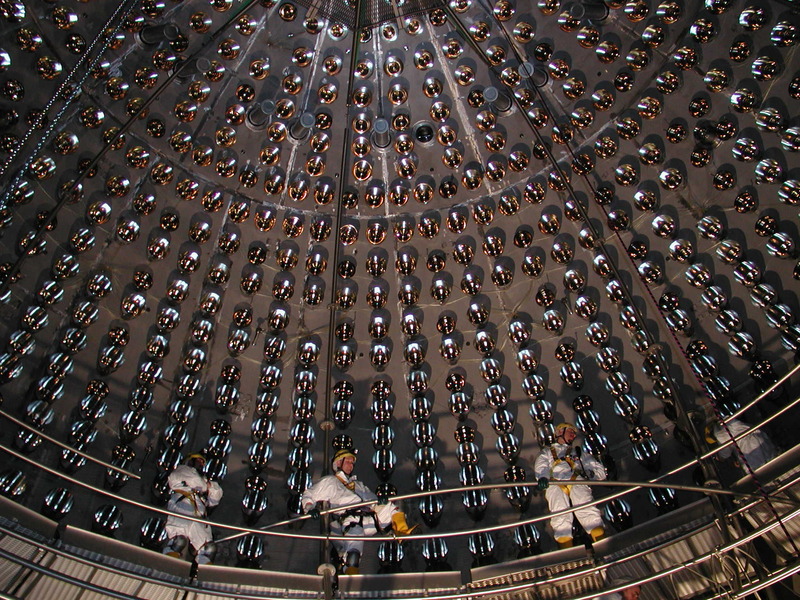 These so-called solar neutrinos are abundant but extremely difficult to detect. They interact only weakly with ordinary matter, causing only one in 1021 to leave a signal in the Borexino detector. Borexino, like all other neutrino experiments, needs to be virtually free of radioactive background to isolate the faint signal of the ghostly neutrinos. For this reason, it is located deep underground at the Laboratori Nazionali del Gran Sasso, beneath the Apennine mountains which provide a powerful shield against cosmic rays: while neutrinos go through the rock unperturbed, the cosmic ray flux is reduced by a factor one million. Moreover, the inner part of the detector must be extremely pure, ten orders of magnitude less radioactive than the ordinary drinking water. Neutrinos, thanks to their elusive nature, are very effective messengers probing directly the innermost part of the Sun (that is if you manage to catch them). Even photons that are produced in the core of the Sun take around a hundred thousand years to reach the solar photosphere, the external Sun layer, from where they are free to escape. In contrast, with neutrinos, we can directly peek into the core of the Sun, the birthplace of its energy, with only an 8-minute delay (the travel time from Sun to Earth at the speed of light). The most pressing question in solar physics is the so-called metallicity problem. Metallicity is the abundance of the elements heavier than helium, which in turn influences the neutrino fluxes. Therefore, with the precise solar neutrino measurements, we can contribute to a better understanding of the features of the Sun composition and its properties. In this paper, the Borexino collaboration finds a hint towards the solar models with high metallicity. In the future, Borexino will attempt to study also neutrinos from the CNO cycle, a secondary mechanism of solar energy production, which is the most sensitive to the metallicity of the Sun. We can study the Sun with neutrinos, but we can also study neutrinos with the Sun. Neutrinos are special particles which come in three flavors, electronic, muonic, and tauonic. Unlike other particles in the Standard Model, they can transform from one flavor into another (and maybe back to the original one) as they propagate through spacetime. The discovery of this fundamental neutrino feature was recognized with the 2015 Nobel Prize in Physics awarded to Arthur McDonald (SNO, Canada) and Takaaki Kajita (Super-Kamiokande, Japan). Solar neutrinos change their flavors with different probabilities when they travel within the Sun (very dense environment) and during their travel from the surface of the Sun to the Earth (vacuum environment). By measuring the solar neutrino interactions over a wide energy range, Borexino plays a unique role to observe both of these energy-dependent flavor-transition phenomena. In conclusion, neutrinos are a powerful tool to study the Sun, which is our reference measuring stick for all the stars far far away. This is crucial for answering open questions in astronomy. At the same time, the Sun can be used to study neutrino properties, which is essential to answer questions in particle physics. All in all, Borexino is a perfect example of the synergy between astrophysics and particle physics, what now goes under the name of astroparticle physics. And we are looking forward to more science fun with Borexino!